The Chicago Stock Exchange Building designed by Adler & Sullivan was erected in 1893-4 at the corner of LaSalle and Washington Streets in what is now Chicago�s Loop. The building was 13 stories tall and was built for a little over a million dollars. 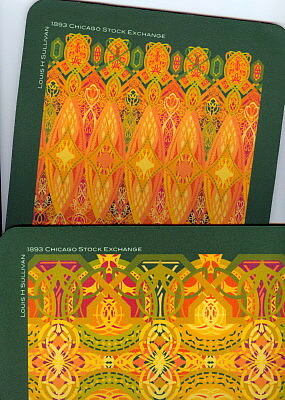 Innovative in design, the building featured a large almost two story high room on the second floor which became the Chicago Stock Exchange Trading Room. Using the new steel framing design of early skyscrapers, this room was unobstructed except for four supporting columns. The steel structure of the ceiling resting on the four columns supported the upper floors of the building. The steel ceiling structure was covered with plaster which in turn was decorated with stenciled canvas applied like wallpaper. The stencils were rich in color and complex in design. Seven of 15 designs are documented which range from a frieze wall covering above mahogany paneled walls to beam, truss and ceiling coffer designs. These two designs covered the truss frieze and the underside of the upper beams. Remastered by our graphic artist, misalignments that existed from the original hand-cut stencils are corrected and the designs become perfect repeats. Colors were sampled from originals. A segment of our digital files are then used to print our two ultra high resolution Mouse Pads in 10 colors. The 1/4" thick Mouse Pads are made of flexible neoprene rubber with a soft polyester laminated tracking surface and are printed in full process color. The images are actually printed into the fibers of the surface of the Mouse Pads which are durable, long lasting, and washable! The Mouse Pad pair are shipped in a USPS Priority Mail flat rate envelope.